These stools were so easy to assemble and they are very comfortable. 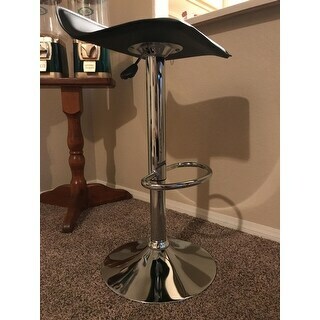 Vogue Furniture Direct Adjustable Height Bar Stool with Chrome Base and footrest is a perfect seating option for your home bar or counter. 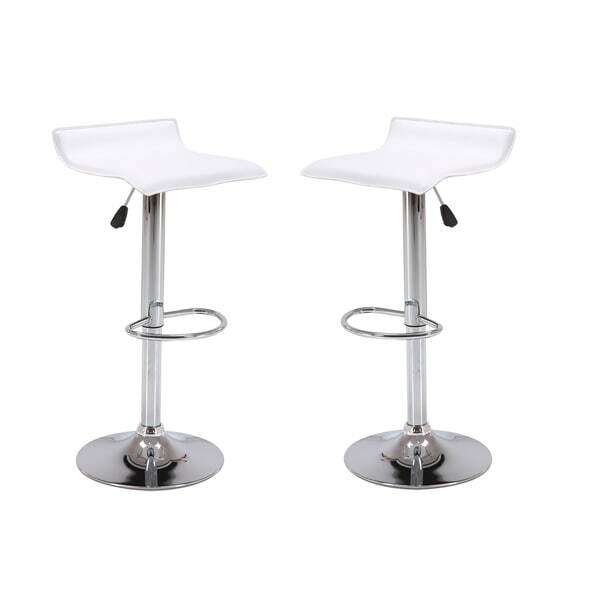 This stool features a comfortable 360 degree swiveling seat with gas-lift height adjustment. Easy-clean leather-like upholstery offers a sleek and versatile look in the area and yet easy to maintain that can stand up to years of use. The base is made with durable chrome-finished metal includes a built-in footrest for stylish comfort. Modern and stylish; it lifts the aspect of my kitchen bar!. Very easy to assemble,ten minutes and I was done on a set of two. 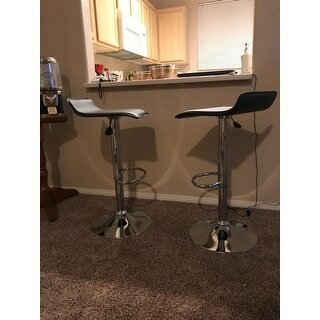 These stools are definitely worth the price! I couldn’t find anything similar in style in any store even close to the coupon price. They look good- simple and sleek- and were super easy to put together. 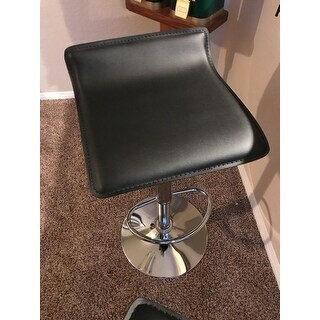 I couldn’t ask for a better set of adjustable air stools for $69. The low back seat lets the stools accommodate smaller rooms! Excellent buy, and easy to put together!! They look nice and it is comfortable, however I am having problems with adjusting the height. However, this is lightweight and looks nice. Also the end piece to the lever was broke off. By the way it is very easy to assemble. These chairs are so necessary. They fit perfect into a small kitchen. The only problem I have is the stitching of the seat is uneven. I am requesting another seat to correct this error. I like the chairs and would buy them again. 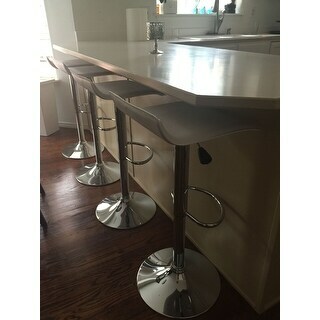 This bar stools are great, they look super pretty and very comfortable, they are so easy to assembling that even my two kids did it by there own. Very nice and easy to assemble. We didn't notice that they were a set, and purchased an extra set. So be aware, there are 2 per box. I ordered these about 7 months ago and they are comfortable and affordable. They were easy to put together. I got 2 black and 2 white. They still look brand new. I love these. My husband said they were very easy to put together. Look great. I wouldn’t want to sit on them all day, they aren’t real comfortable. Better than expected and so easy to assemble. Beautiful addition to my home. These stools are beautiful and easy to assemble! Loved these stools...took less than minutes 2 put 2gether... look awesome!!! Love these Stools ! Easy to put together . Very sturdy and chic ! "What is the range that the seats can be adjusted to? I am looking for no higher than 24 inches Thanks "
The seat height ranges from 24-31.5 inches. "What is the product shipping weight for the set of two stools?" The weight of one box is 31lbs (set of 2 stools). I think they will be very function able and fashionable in our new apartment.